Steam mops combine the usability of a mop with the intense cleaning power of a heat steamer. But how do you know which one to choose? With our quick guide, you can find out which steam mop is perfect for you, and we also review the 9 Best Steam Mops 2018. 3 Buying Guide: Which Steam Mop is Best for You? 3.1 Do You Have a Furry Pet? 3.2 Do You Have Children In Your Residence? 3.3 What Kind of Floors Does Your Residence Have? 3.4 Do You Have Back Problems or A Similar Medical Condition? 3.5 Do You Have Room To Store It? 3.6 How Long Does the Steam Mop Last? 4.1 How Does a Steam Mop Operate? 4.2 What Material Should I Not Use My Steam Mop On? 4.3 Why Won’t the Stain Go Away With a Mop or Handheld Scrub? 4.4 Can Steam Mops Kill Dust Mites and Fleas? 4.5 Will a Steam Mop Upset My Chemical Sensitivities? 4.6 Why Are Steam Mops All of Sudden Becoming Popular? Floor Types — Whether or not the steam mop efficiently cleans all floors should be an important consideration when purchasing a steam mop. Does the steam mop effectively kill germs and bacteria? Does it work on all floor types or just some? Cord Length — Cleaning you floors should not be a real hassle; make sure the steam mop you buy is both comfortable and comfortable to use. A long cord length can mean less unplugging and carry. Weight — How heavy is the steam mop? This factor is important if you have to carry your steam mop upstairs or transport it a lot. Water Tank Capacity — It is essential to know how much water your steam mop can hold. This water tank capacity will affect how long you can mop before having to refill it. The Bissell PowerFresh Steam Mop provides a fantastic clean for a wide range of floor types, and it eliminates up 99.9% of germs and bacteria using just steam. However, if you want to freshen up the smell of the house, there is scented, demineralized water you can add on separately — free of any harsh chemicals. The fragrance disks are another excellent edition by adding a pleasant scent to the entire room. In addition to a high, medium and low setting, for different types of floors, there is also a carpet glider included with the steam mop. While the carpet glider will not get out old, stubborn stains, it will freshen the appearance of the carpet and leave behind a pleasant scent. For hard-to-remove stains of hard floors, users can switch out the soft pad for the scrubby pad. Included in the set are the Bissell PowerFresh Steam Mop, a washable microfiber soft pad, a washable microfiber scrubby pad, a carpet glider and two spring breeze scent disks. If you are on edge about trying a steam mop for the first time, the barebones Shark Steam Pocket Mop is a reliable beginner product to work for beginners. Mostly, the Shark Steam Pocket Mop is a Swiffer Wet Jet that you do not need to buy extra pads for after you finish. The set included two machine washable microfiber pads with the machine, but you can always buy more if you run out. The Shark Steam Pocket Mop is undoubtedly one of the lighter steam mops on the market right now, which contributes to its incredible maneuverability. When combined with the soft grip handle, cleaning the floor suddenly becomes smooth and manageable — no more scrubbing on your hands and knees for you. The only downside is the Shark Steam Pocket Mop is slightly more limited when it comes to which floors/ surfaces it can work on while using it. If you cannot decide between the cleaning power of steam alone or a traditional multipurpose cleaner, the Hoover TwinTank Disinfecting Steam Mop is for you. With its patented dual tank technology, the steam mop can switch between regular steam and the Hoover SteamPlus Disinfectant solution with the flip of a switch. This solution is equally valid and safe: it is nontoxic, biodegradable and green friendly. At a length of thirty feet, the Hoover TwinTank Disinfecting Steam Mop comes with the most extended cord on this list, which makes it great for bigger houses. The triangle shape of the mop makes it very useful for getting into tight spaces and corners. An included carpet glider allows the machine to improve the appearance of carpeted flooring as well. The product is also quick to use — it only takes around thirty seconds for it to heat up. In addition to the machine itself, the Hoover TwinTank Disinfecting Steam Mop also comes with an eight-ounce bottle of the Hoover SteamPlus Disinfectant solution, a cooling tray, carpet glider and three machine washable microfiber triangle pads. The Bissell Powerfresh Lift-Off Pet Steam Mop is one of the more advanced models, offering a far broader array of tools, attachments and cleaning functions than other models. Notably, the center of the mop can detach from the unit, which allows you to clean both on the floor and off it. When the group is separated, you can switch thirteen different attachments to fit your specific cleaning needs. For old, dirty tiles, the grout cleaner can lift the muck from the cracks and make the grout white again. Several bristle brush scrubbers are ideal for appliance cleanings, like microwaves, stovetops, sink faucets and more. Or, for hard-to-remove messes, like dried food, there is the flat scraping tool. If a mess occurs out of your reach, the extension tool will help you reach it. The window squeegee tool leaves impressive shine-free glass wherever you use it. The fabric tool finally allows you to give your furniture the thorough cleaning it has been needing. If you have pets, the angle tool is ideal for getting to hard-to-reach spots like their toys. Though the Bissell Powerfresh Lift-Off Pet Steam Mop is a bit heavier than other steam mops on this list, it works to its advantage when faced with a stubborn stain. The heaviness of the mop allows for more control over scrubbing than some lighter models. Included with the Bissell Powerfresh Lift-Off Pet Steam Mop are a washable microfiber soft pad, a washable microfiber scrubby pad, an adjustable water cup, thirteen different tool attachments, tool carrying bag, a microfiber towel and two spring breeze scent disks. Another simple, easy-to-use steam mop for consumers that do not need all the bells and whistles associated with some of the higher end models. The controls on the Shark Original Steam Mop are uncomplicated and intuitive — anyone can use it. It is good at its job, and it gives floors thorough routine streaming, but thick stains and grime slow the machine down. On-demand steam allows you to save some of the water in your take since it is not continuously spraying, even when it is not moving. Also, the small figurehead allows the steam mop to get to hard-to-reach spaces, like underneath cabinets and couches. However, the Shark Original Steam Mop does have some drawbacks. The tank size is tiny compared to other steam mops, so unless you only have one or two rooms to clean you will probably need to refill it before you finish. The head also pivots in only one direction, making it a little harder to maneuver in close, tight spaces. The Shark Original Steam Mop comes with one washable microfiber pad and a funnel to load water into the tank. Most people who are familiar with using a steam mop know it is usually a multiple step cleaning process. Before going over the floors with your steam mop, you typically need sweep up any debris, like crumbs or hair. However, with the Bissell Symphony All-in-One Vacuum & Steam Mop, sweeping before you steam is a thing of the past. With the dry tank technology included on the steam mop, you can quickly switch between suction, low steam and high steam. The Bissell Symphony All-in-One Vacuum & Steam Mop has a first stream cycle, meaning it uses little water. This lack of water means the tank does not run out as quickly and the floors dry faster. Unfortunately, the Bissell Symphony All-in-One Vacuum & Steam Mop cannot be used on carpets, unless you buy the carpet glider attachment separately. 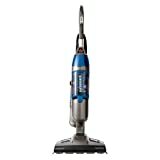 Though the Bissell Symphony All-in-One Vacuum & Steam Mop is a bit bulkier than some other types of steam mops, it makes up for its larger size with a five-way adjustable handle and foot-released pad control. The steam mop comes with four replaceable microfiber machine washable pads. As with other Bissell products, you can also buy the scented demineralized water and the freshening discs if you prefer a pleasant smell to go along with the steam. The Oreck Steam-It Steam Mop is the marathon runner of the group, lasting longer than any other steam mop on this list. This longevity is thanks to its incredibly large water tank capacity. With a full tank, the Oreck Steam-It Steam Mop can last around forty minutes before being replaced (even while it runs on a high setting). 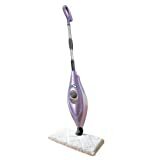 The Oreck Steam-It Steam Mop also offers above the floor cleaning capabilities. With six different attachments that replace the end of the unit, you can scrub bathroom walls, ovens, sinks and more. The steam mop can also work upside down without spillage, so do not worry about those hard to reach areas. Unfortunately, the cleaning pad is a bit finicky when in use, and it has to be attached manually with clips. This looseness can lead to frequent malfunctions during the steaming process, which kind of offsets the high usability of Oreck Steam-It Steam Mop. However, the cleaning pads themselves are excellent — absorbing up to six times their weight. And, like all of them, they are machine washable. In addition to the mops itself, the Oreck Steam-It Steam Mop kit comes with four machine washable cleaning pads, two universal attachment clips, six different attachable tools for above ground cleaning, a water tank funnel and maintenance devices. The Shark Professional Steam Pocket Mop is a bit more versatile than other Shark steam mops. Perhaps most notable is the different cleaning settings. With the dust setting, you can use the Shark Professional Steam Pocket Mop as a modified broom, sweeping up dust and other small debris. The mop setting provides steady steam for light stains and cleaning. However, the scrubbing setting is the real powerhouse — taking care of stubborn stains. The Shark Professional Steam Pocket Mop also differs from other models with its streaming feature. Instead of the pump on demand steaming, this model offers continuous, non-stop steaming. While this feature is indeed more convenient for cleaning, it does have its drawbacks. The fact that the steam mop is always on means a lot of water gets used, sometimes unnecessarily. You still have to turn the unit on and off if you are going over an area you have just cleaned. Also, while the Shark Professional Steam Pocket Mop can clean tiles, it does not work well against the grout in between, which is unfortunate for many bathrooms. The Shark Professional Steam Pocket Mop comes with two, machine washable scrubbers. 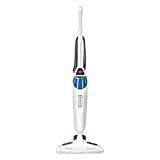 The Light ‘N’ Easy Multifunctional Steam Mop is similar to the Bissell Powerfresh Lift-Off Pet Steam Mop in that it also has a conveniently detachable midsection for different types of cleaning. However, it offers even more cleaning capabilities. In addition to a function as a floor steam mop, appliance steam cleaner, carpet cleaner mirror, and glass cleaner, the Light ‘N’ Easy Multifunctional Steam Mop also work as a garment steaming, for dry cleaning suits and other clothes. The steam mop offers three different settings for traditional floor steam cleaning, which is helpful for different — potentially damageable — floor types. Unfortunately, the small tank means the Light ‘N’ Easy Multifunctional Steam Mop runs out of the water quite frequently. Usually, it lasts around twenty minutes on the normal setting. On the maximum setting, it barely lasts ten minutes. However, the Light ‘N’ Easy Multifunctional Steam Mop easily makes up for this with its performance. It is very effective at removing stains many other steams mops would struggle or fail to deal with while cleaning. It is also simple and relatively uncomplicated — a nice feature for a machine that looks fairly intimidating to the average user. 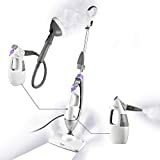 The Light ‘N’ Easy Multifunctional Steam Mop kit comes with one machine washable cleaning pads, a jet steam nozzle, a flexible rubber hose, a small handheld attachment with a soft cloth pad to steam things such as windows, a water cup used to fill the water reservoir. Buying Guide: Which Steam Mop is Best for You? Since even the cheap steam mops are relatively expensive for a cleaning product, there are important considerations to keep in mind when you buy one. A steam mop purchased for the wrong using conditions can adequately clean the house, or worse, damage the floors. Here are several questions you can think about whenever researching a new steam mop purchase. Do You Have a Furry Pet? Pet hair can be a big nuisance when steam cleaning. Too much dog or cat hair can clog the steam mop when it is spraying, which usually requires repair. Make sure to always sweep the floor before steaming it if you own a pet. 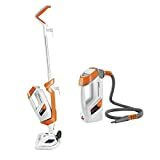 Alternatively, you can purchase one of the steam mops explicitly made for taking care of pets, such as the Bissell Powerfresh Lift-Off Pet Steam Mop, the Bissell Symphony All-in-One Vacuum & Steam Mop, or the Light ‘N’ Easy Multifunctional Steam Mop. Do You Have Children In Your Residence? Kids inevitably leave messes on more than just the floor. In order the deal with them, you will want a steam mop that can steam both floors and other stain-prone objects. Specific steam mop units you can clean stains on couches, beds, countertops, carpets and many other surfaces where kids may make a mess. The more versatile, the better. It is also vital that you find a steam mop that is powerful enough to remove these stains when they happen. As such, you will want a model that has a robust high scrub setting. We recommend the following steam mops for households with children: the Oreck Steam-It Steam Mop, the Bissell PowerFresh Steam Mop and the Light ‘N’ Easy Multifunctional Steam Mop. What Kind of Floors Does Your Residence Have? Make sure you research whether or not the steam mop you are interested in is compatible with the floor types in your home. Some models of mops have a limited selection of which floors types they can handle. Others might clean tile, but not the grout in between the tile pieces. Never use a steam mop if you have unsealed hard floors because doing so will just further the damage. Also, be careful if you have hardwood floors. Often if you steam your shined hardwood floors, the process can remove the glossy shine from them. Even on regular hardwood floor, too much steam can sometimes damage the wood, or leave marks. Make sure to use the high setting sparingly or buy a steam mop with controlled steam spray instead of a continuous one. Do You Have Back Problems or A Similar Medical Condition? If you have trouble lifting objects due to back or spine condition, you will probably want a steam mop on the lighter side. Even when not be carried, a more massive steam mop can be a significant inconvenience, especially if you have stairs in your household. Try to look for light models, usually under six pounds. We recommend the Shark Professional Steam Pocket Mop, Hoover TwinTank Disinfecting Steam Mop, and the Shark Original Steam Mop. In addition to weight, it is also essential to make sure you have storage space for the steam mop. Some small cleaning closets might not provide enough adequate space. Or, if you travel a lot with the steam mop, you will want something on the slimmer side. Some of the bulkier models like the Light ‘N’ Easy Multifunctional Steam Mop or the Bissell Powerfresh Lift-Off Pet Steam Mop might not be ideal for households with limited space. How Long Does the Steam Mop Last? The lifespan of any steam mop is essential to any rational consumer. You do not want to be continually worrying about maintenance and replaceable parts. Try to find out which models have a longer lifespan than others, and always remember correctly to clean you steam mop. If you add soap to a steam mop tank, it will permanently ruin the machine. Also, no matter how good you take care of your steam mop cleaning pads, you will need to replace them at some point. It does help if the steam mop you buy includes extra sets of washable slips because you will need more of them at some point. The first step when steaming the floors of a room is moving any unnecessary furniture out of the way. If you are doing a cursory clean of the room, it is not necessary, but generally, you want to make sure you steam everything when you use your steam mop — to avoid patchy spots. Next, you need to sweep or vacuum the floors. As we mentioned before, steam mops can easily malfunction when they come in contact with too much debris. Next, prepare your steam mop by adding water and any mineral deodorizers you want. Plug the machine into the wall and give it time to warm the water up. Start in the corner of the room and begin to work your way down. Before starting, try to plan out the best way to make your way through the room without going back over anything during the process. Move in straight lines to avoid random looking zig-zag lines everywhere. Once you finish the cleaning, make sure to let the floors air dry before you walk on it or move any furniture back. After you end steaming the floors, make sure to clean your steam mop properly. Rinse out the water tank and immediately throw the dirty cleaning pads into the washing machine. Steam mops are relatively new technology, so it is more than usual to have some questions about them. Here are some of the most frequently asked ones like how they work and what they are well against when cleaning. How Does a Steam Mop Operate? Steam mops convert tap water into a heated, low moisture vapor that disinfects floor material. The heat, when combined with the friction created by the cleaning pads, makes it much easier to lift stuff off from the flooring. The low moisture nature of the steam means you do not use nearly as much water as a mop or squeegee. Most of the time this method can be used on carpets and kitchen appliance, like ovens, too. The heated vapor removes grease and other residue left behind. What Material Should I Not Use My Steam Mop On? Though most steam mops are generally safe to use on sealed hard floors, you should be wary of using it on any potentially heat-sensitive material. Do not use your steam mop on delicate material like velvet, silk or thin plastic. Also, you should avoid glossed hardwood as steam vapor can potentially remove the shine. Why Won’t the Stain Go Away With a Mop or Handheld Scrub? The traditional way to remove a stain from the floors has always been to apply a chemical solvent and scrub hard until it goes away. Unfortunately, this method only covers up the problem. Instead of dealing with the root of the stain, the chemicals just burn away the top layer of the flooring. Steam on the other hand works a lot like a good acne cleanser by bringing dirt up from the pores, instead of blocking them further. It is also far more comfortable on the back and muscles. You do not need to apply the same amount of hard force as you would with a mop. And no more sitting hunched over a stain while scrubbing to no avail. Can Steam Mops Kill Dust Mites and Fleas? Yes, steam mops can take care of dust mites and fleas in the home. In fact, heat is the recommended way to exterminate these pests that often accompany pets. Unfortunately, before the steam mop, it was tough to apply heat to upholstery like couches and chairs. Thankfully, the 180-degree vapor is more than enough to take care of dust mites and fleas on dog beds or any other piece of furniture you suspect may contain them. Will a Steam Mop Upset My Chemical Sensitivities? No, a steam mop will not affect your chemical sensitivities. If you get headaches or feel dizzy after inhaling a small number of cleaning products, you likely have some degree of chemical sensitivity. A steam mop is perfect for you because it removes any potentially irritating reactants and replaces them with steam. Thanks to the heating system, water is just as useful as the chemical removers, so you do not have to worry about a decline in quality. Why Are Steam Mops All of Sudden Becoming Popular? Steam mops are just now becoming popular because they are a relatively new piece of technology. Though steam mops have already been around for a while in Europe, they are just now coming to North America. Because North America and Europe use different power supplies, it took a while to re-engineer them to be compatible with our outlets. But now that the technology is here, steam mops continue to sell more and more each day. Steam mops are an excellent cleaning method because they kill as many germs and bacteria as disinfectants, but contain no harmful chemicals. However, as you can see, there are plenty of factors that go into finding the best steam mop for you. It is not merely a matter of which one is best — but instead, which one is best for you? Hopefully, this guide helped you pick and use your steam mop.